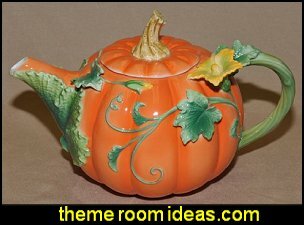 3' Harvest Urn Tree This festive urn tree comes pre-decorated with pumpkins, leaves, burlap and berries. 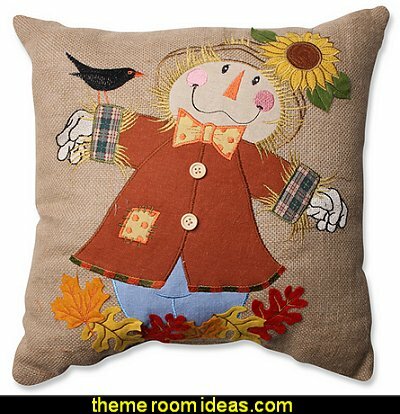 Bring festive touches to your décor this fall! 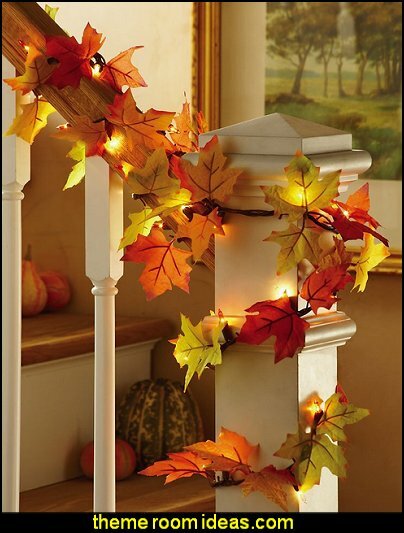 Lighted Harvest Garland Decorate the doorway or banister with this bountiful harvest garland that adds a festive touch to fall décor. 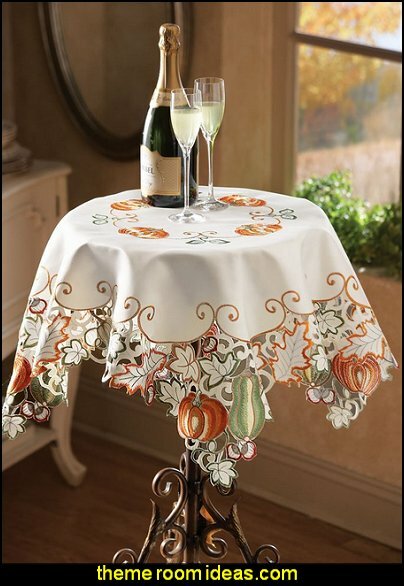 A grapevine base features pumpkins, leaves, burlap & berries. 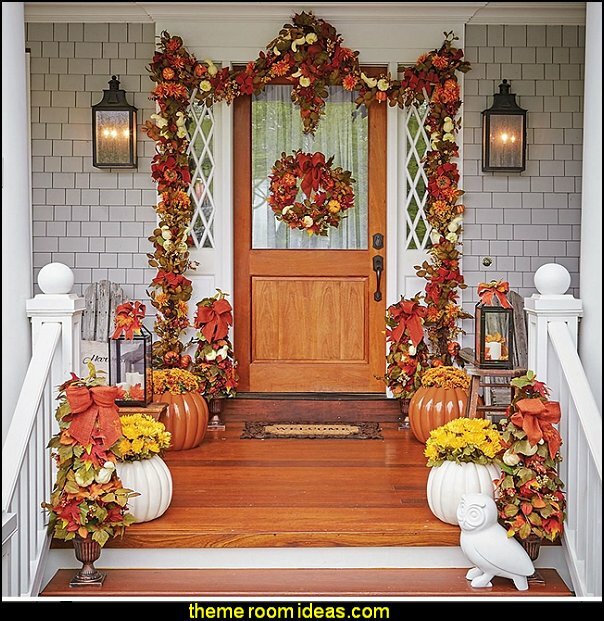 24" Outdoor Harvest Wreath Decorate for fall with this perfect outdoor harvest wreath featuring pumpkins, leaves, burlap & berries on a grapevine backing. 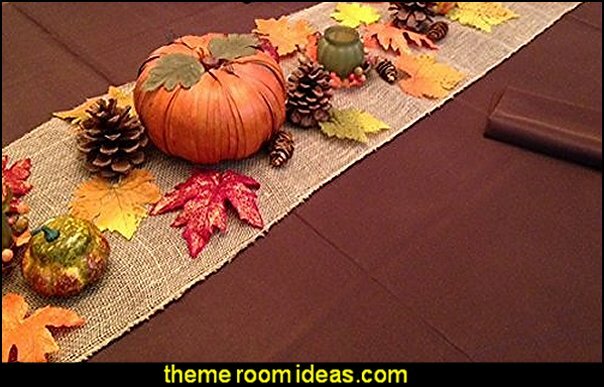 Amber, orange, burgundy, tan and sage green leaves are lovely against a chocolate brown background, while the reverse side is striped in complimentary colors. features three cascading tiers of beautiful natural jute burlap. 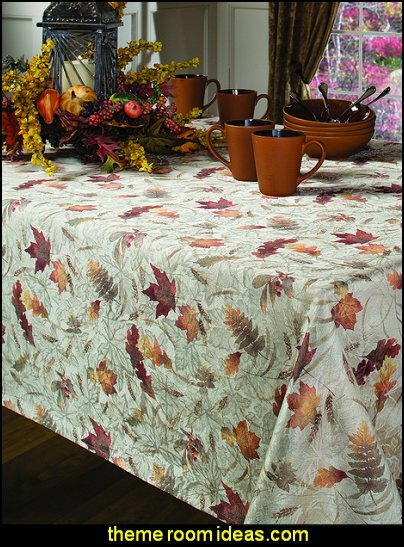 This rustic table skirt hangs down 30 inches and is 21 feet long. 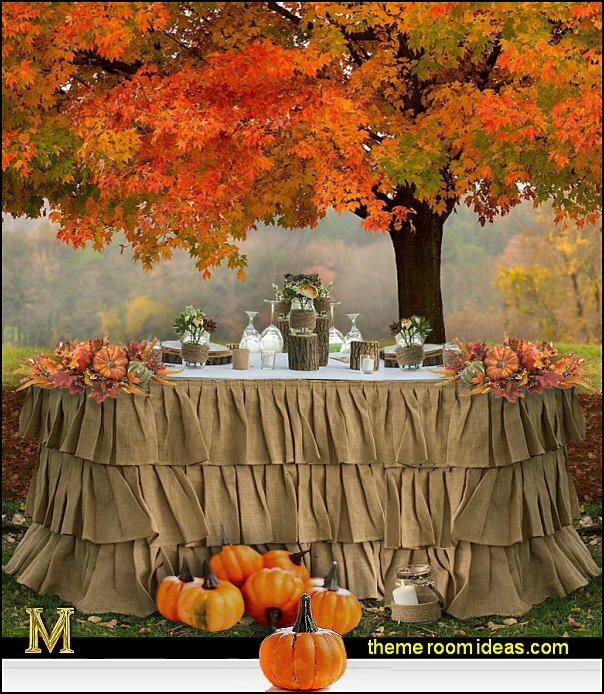 Use this Tiered Ruffle Burlap Table Skirt for any special event. 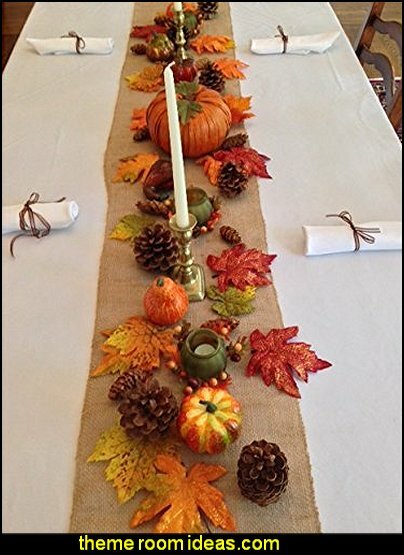 1 burlap table runner, 10 each 20" x 20" matching white dinner napkins with accenting ribbon ties. 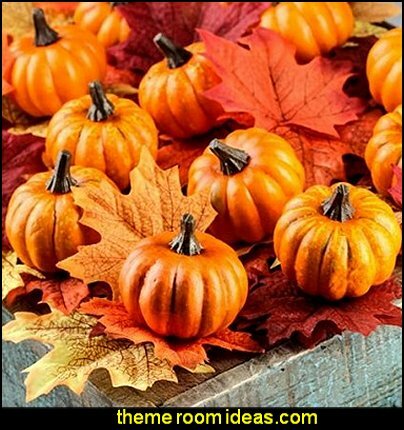 Fall decorative harvest vegetables, gourds, pumpkins, decorative pine cones, cornucopia basket and maple leaves. 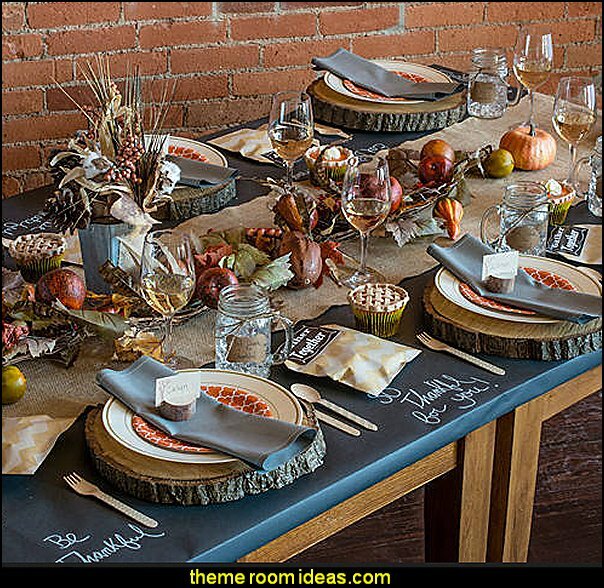 Proper table place setting instructions included for a polished look. 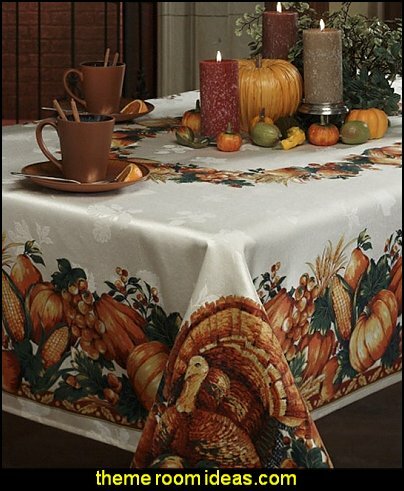 Beautiful, festive, Thanksgiving table cloth. 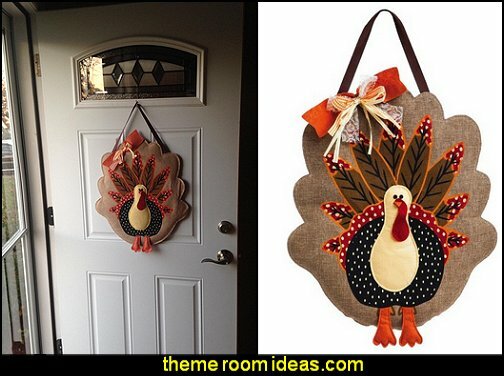 Colorful and clever turkeys hold your silverware while the napkins double as their tailfeathers. 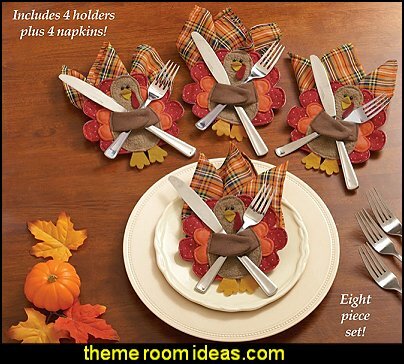 Set includes 4 turkeys whose wings wrap around your silverware. 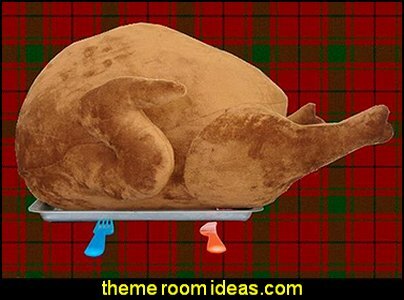 Four plaid napkins slip into the backside to create their tailfeathers. 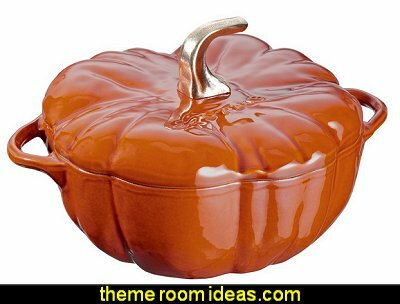 Great for individual servings of stuffing, mashed potatoes, green bean casserole and more, these pumpkin-shaped dishes have handled lids to keep the contents warm. 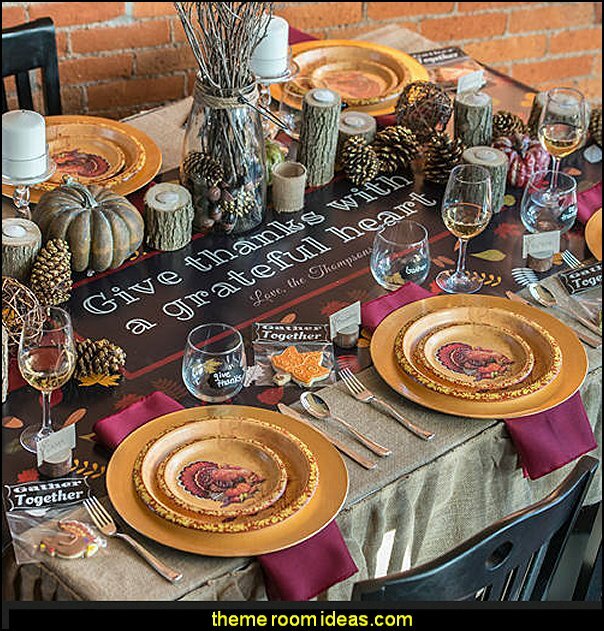 Fall not only brings beautiful leaves, warm cider and hayrides in the country...it also brings get-togethers and the cherished Thanksgiving dinner. 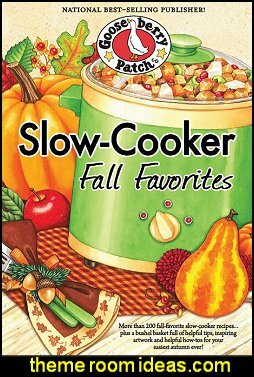 What a perfect season to put your slow cooker to work, and what better cookbook to use than Slow-Cooker Fall Favorites? From breakfast to soups, dinners to desserts. to watch the big game and munch on Spinach Queso Dip and Honey-Garlic Meatballs. Whip up some Cuban-Style Pork roast with a side of Mushroom & Parsley Stuffing or Veggie Fettuccine Alfredo. Be sure to top it all off with a big slice of White-Chocolate Strawberry Cheesecake. 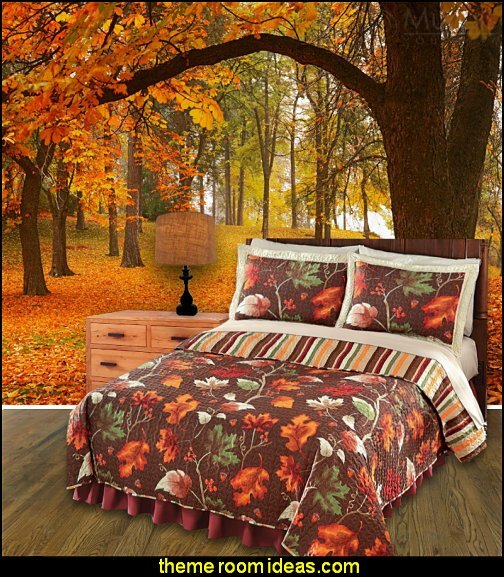 Plus, there's an entire chapter dedicated to those warm, nostalgic memories of autumns past ... sure to get you in the spirit of the season. 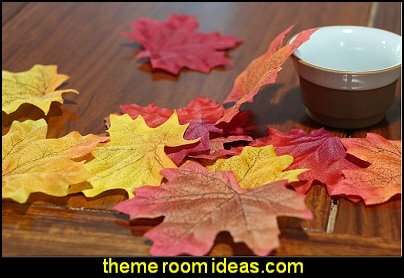 So sit back, relax and let your slow cooker do the work while you enjoy the best that fall has to offer. 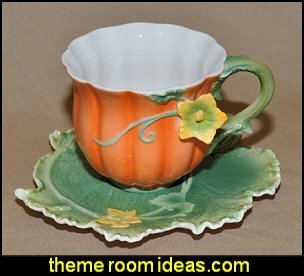 Porcelain cup and saucer is 3 1/4" tall and 3 1/4" wide and sits on a 6" green leaf shaped saucer. 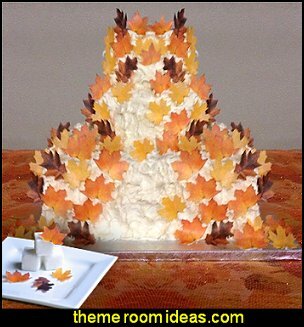 These lifelike leaves are completely edible! 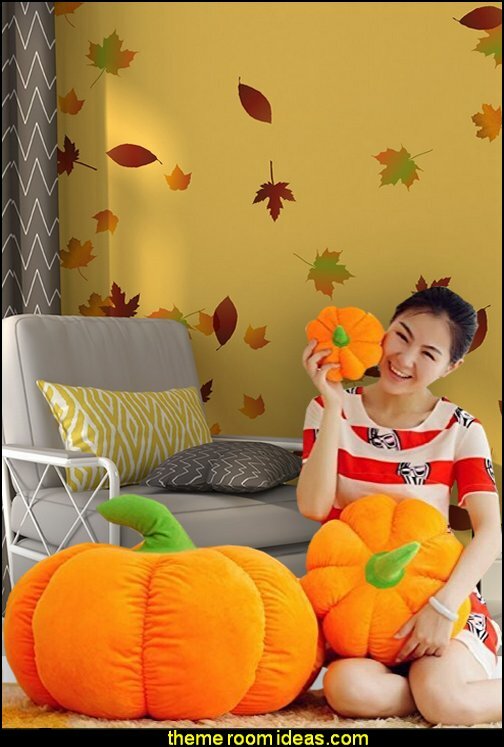 Smooth blend of comforting spice and the natural goodness of pumpkin has signaled the start of the autumn season in many a home. This beloved fragrance perfectly captures the inviting scent of pumpkins baked in simmering spices of clove, nutmeg, and cinnamon . . . and sweetened with brown sugar. Irresistible! A fall classic. 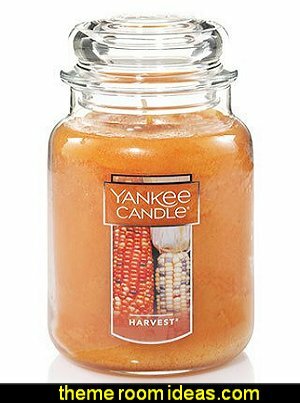 The golden hues of the harvest, with "golden" spices, softened and smoothed with the addition of sweet autumn fruits, and musk, come together in an inviting blend. 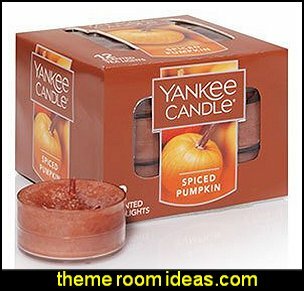 Cinnamon, cloves, and musk - with a hint of sweet apples and pumpkin - make for a recipe that makes any home instantly cozy and welcoming. 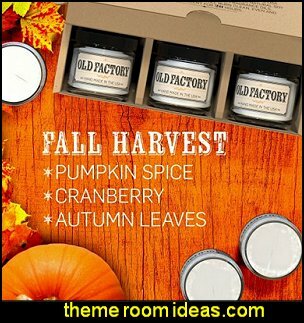 These 4-ounce candles will remind you of all your favorite fall scents. 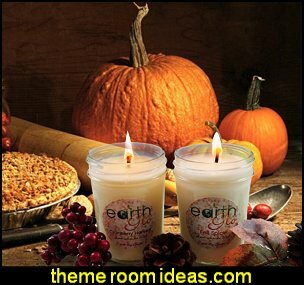 This set of 3 aromatherapy candles features the rich creamy scent of spiced pumpkin, the sweet scent of cranberry and the earthy scent of fallen leaves. 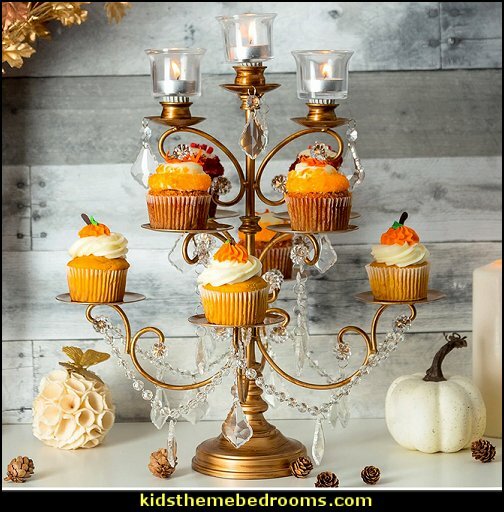 Burn your Fall Harvest candles one at a time for a clear, singular scent or light more than one to create a more complex profile. Cranberry Harvest - Spicy and woody fragrance of tart cranberries, cinnamon & ground cloves. A lovely winder scent! Winter Spice - a spicy and complex combination of cinnamon bark, nutmeg seed, clove bud, pumpkin fruit, vanilla bean and ginger root. 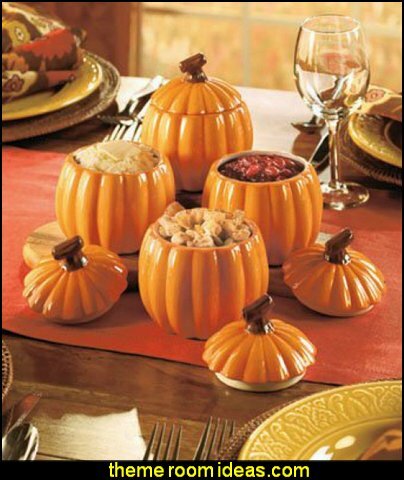 Three beautiful candle holders lovingly nestled into a bevy of Autumn fruits, berries and foliage. 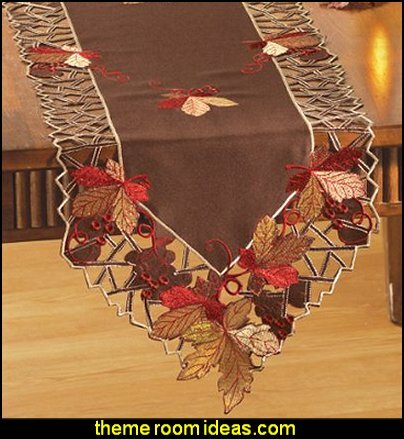 It's the perfect accessory for any holiday décor, from a dinner table to a bookshelf to a warm hearth. 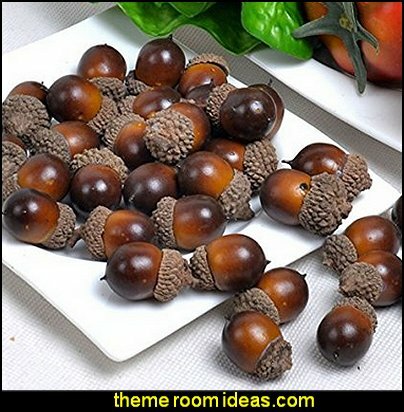 Also makes a thoughtful gift that will be welcomed in any home. Great collection of instrumental versions. 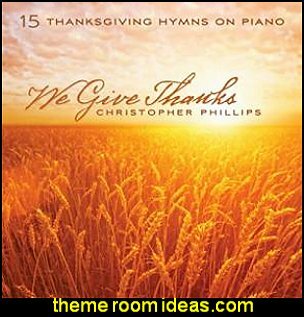 If you like the old hymns - and you enjoy simple folk-style instrumental music AND you want to feel your gratitude expressed in music ... then this is the album for Thanksgiving and all year round. The tunes are upbeat but reverent, and you will feel your heart swelling in thankfulness to God for all his gifts as you listen and hum along. 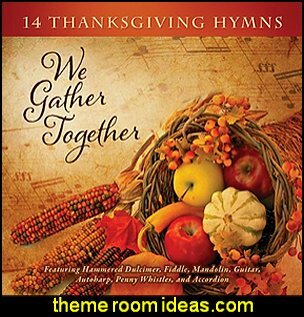 Beautiful background music for celebrating Thanksgiving. Really helps put one's thoughts on giving thanks to our Creator! Music selections are varied enough that you will be playing this all year, not just on Thanksgiving. Everyone’s favorite fun-filled, family-filled, food-filled holiday is almost here! Follow along as the feast is prepared, cousins are greeted, and everyone gathers around the table, all with an extra helping of holiday fun. At the end of the book the family say a prayer of thanks. 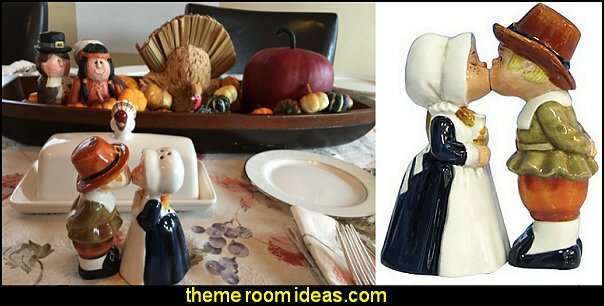 Thanksgiving is about pilgrims and history - and turkey, of course! - but most importantly, it's a holiday all about everything that we are thankful for. Cheerful, colorful illustrations accompany the simple text in this celebration of family, friends, and the holiday that brings them all together. As Thanksgiving approaches, Turkey fears that he will be the centerpiece of the holiday meal. Thus begins his quest for the perfect disguise so he won't be found when the time arrives. He ties a brush on the back of his head and wears a tiny saddle because surely no one would eat a horse for dinner. But the animals still recognize him. He tries to become a cow, a pig, a sheep, and a rooster. He does not look like any of them. When he hears Farmer Jake tell his wife that if they can't find the turkey, maybe they should eat the rooster for dinner, the protagonist comes up with the perfect ruse. 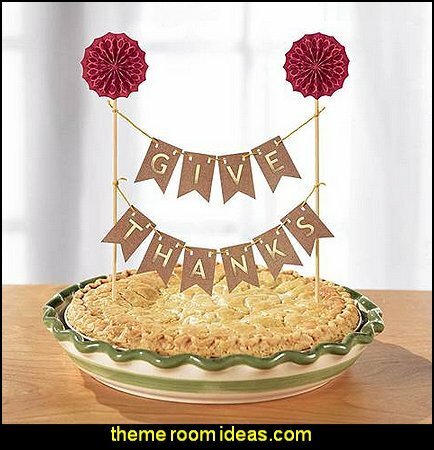 he Thanksgiving Pennant Banner Picks are great for pies, cakes or wherever you want to add a little festive touch. Alice Dalgiesh brings to life the origin of the Thanksgiving holiday for readers of all ages. Giles, Constance and Damaris Hopkins are all passengers aboard the crowded Mayflower, journeying to the New World to start a new life. Things get a little more cramped when their baby brother Oceanus is born during the passage. However, when they arrive, there are even worse challenges to face as the Pilgrims are subjected to hunger, cold, and sickness that put their small colony in great danger. With the help of the Native Americans though, they might just be able to survive their first year in this strange land - and have a November harvest to celebrate for generations! This book is excellent. It is filled with interesting facts and gives you a better understanding of what the pilgrims went through when they journeyed to and settled in this country. It is also very clear about the pilgrims coming to America for religious freedom and celebrating Thanksgiving as a day to give thanks to God.